The rain continues to come down and, besides tomorrow, shows no signs of ending for the next several days. I changed out my header picture to bring a happy note ... Spring Is Springing! Can't really say that it has actually sprung yet but I'm sure all this rain will help things along. Here's the full picture of my Tulips. I finished it yesterday (Friday) morning. 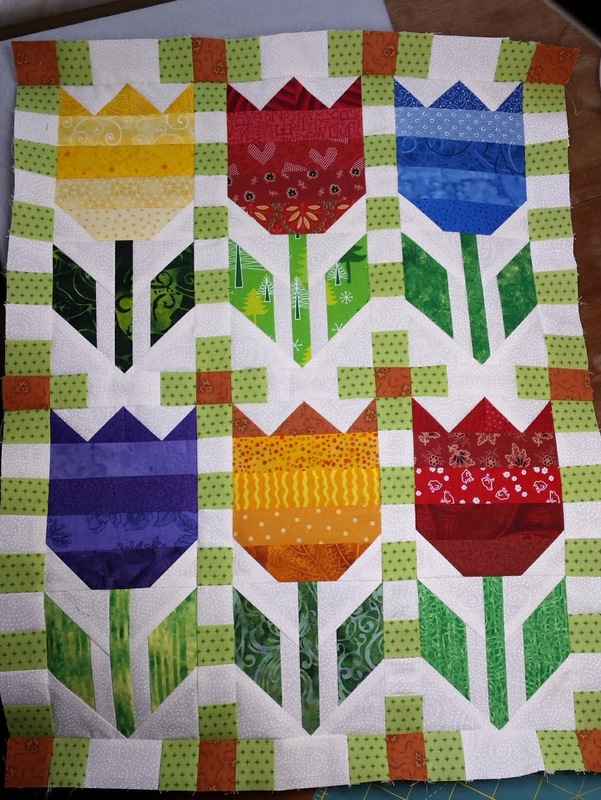 Can't wait to quilt and hang it -- so cheerful! 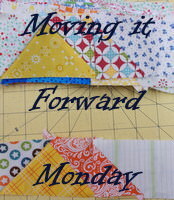 Yesterday I hurried through my chores so I could have a good report for FNSI, which stands for Friday Night Sew-In. I'll be linking up with my friends HERE. You should take a peek and see what all we've been doing. So much talent everywhere! Here's my current progress on my projects. 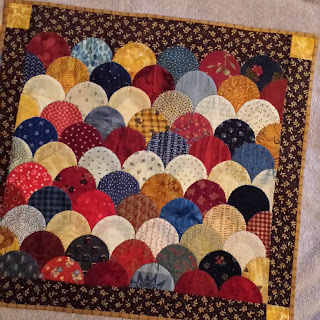 First, I got the binding sewn onto my Clam Shells wall hanging. I rinsed it out to get my markings out and it's laying out to dry. Hopefully the shadowing will go away once it's dry and will look like it did before I wet it down. Otherwise I'm going to wish that I had faced the clams with a white fabric. UGH! I also noticed that the red clam in the middle of the 2nd-from-the-top row bled into the clam to the left below it. Hmmmm ... Looks like there will be another rinse with a Color Catcher! The other thing I wanted to mention about the Clam Shell binding: I listened to the way Edyta Sitar does her wall hanging binding on The Quilt Show. Do you know her? She's a designer for Moda fabrics and is an incredibly talented lady. Anyway WOW! Do my corners ever lie flat!! Think that will be my go-to method in future. Love to learn new tricks. As always I continue to work on my Mosaics. 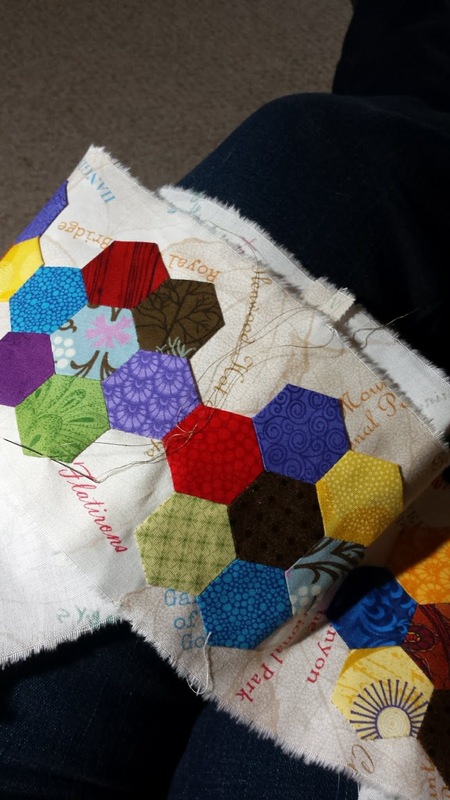 This is currently in my lap, the final hexie border being appliqued down. YIPPEE! When I got home, I made up this Mediterranean Yogurt Cake. It smells delicious and has two mandarin oranges zested into the batter. 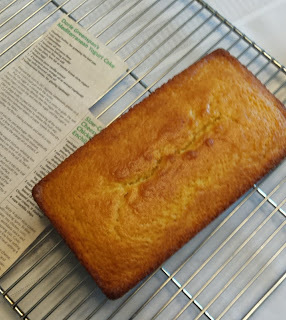 All I need to do now is to brush a honey glaze on the top. It should taste good after the marinated flank steak, risotto, and wilted spinach dinner I've planned. Don't forget to check out what everyone else did at FNSI and have a great rest of your weekend. I'll be busy sewing down that last hexie row in my usual spot in the den!